The International Monetary Fund says inflation will reach 1,600% this year. 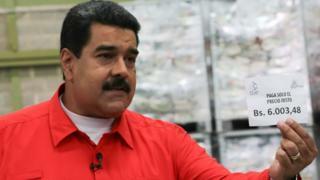 Mr Maduro said he was raising the monthly minimum wage to 40,000 bolivars, about $60 (£49) at the official exchange rate, or $12 on the black market. Opponents say the president's incompetence and 17 years of failed socialist policies are behind the crisis. They call for the removal of Mr Maduro, who was elected in 2013 for a six-year term after his predecessor Hugo Chavez's death. The main business association in Venezuela said the wage increase was announced without consultation and could result in layoffs and force small businesses to close. Opposition lawmaker Jose Guerra said the Central Bank would print more money to pay for the rise, resulting in higher inflation. "This has already been studied," he said on Twitter (in Spanish).